Check the Lists and Rankings page for county, state, metro, or national totals. Check the maps and charts page for graphic information about specific groups. A quick overview is available here. This is an update of the 1952, 1971, 1980, 1990, and 2000 studies originally done by the National Council of Churches and the Glenmary Research Center. Since 1990, the Association of Statisticians of American Religious Bodies (ASARB) has sponsored the studies. 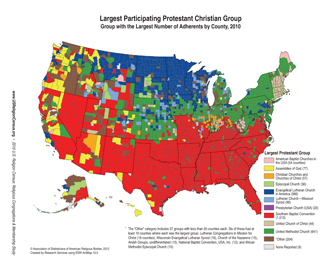 Each participating religious body supplies the number of churches, full members, adherents, and attendees for each county. See "Data Collected" for more information. Our data collection office can assist any group with compiling their data to the county level. The book includes data tables, documentation, 32 pages of color maps and charts, and a wall map of religious families by county. It can be ordered at 1-800-877-0700 or on-line. The full-color wall maps are available from Glenmary Research Center.